A recent Huffington Post article carried this provocative headline: “Millennials Work Better.” The article went on to make the case for why Millennials have a range of strengths that make them well-suited for the workplace. It also served up a refreshing break from the tired stereotypes that dog millennial workers. That being said, the headline also perpetuates the ongoing us-vs-them narrative that relentlessly compares baby boomers’ work strengths and styles with those of millennials. Likely a better conversation should focus on what each generation can learn from the other as they work together in a range of different settings. In this two-part blog series, we’ll take a deeper dive into what these two generations of workers stand to learn from one another. To read Part I and learn what Millennials can learn from Baby Boomers, click here. Work-life balance: The boomer work ethic is undeniable, and often enviable. Yet for many boomers the tendency to prioritize work over all other aspects of life comes with a hefty price to happiness, health and more. Millennials saw some of their parents burn out and want no part of it. A common millennial attitude is that work is an important priority, but doesn’t come at the expense of working out, spending time with friends or personal development. 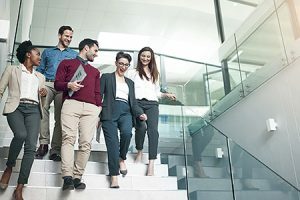 According to a new survey of nearly 10,000 workers in eight countries by Ernst & Young’s Global Generations Research, Millennials were most likely to say they would take a pay cut, forgo a promotion or be willing to move to better manage work-life demands. Frequent feedback: Boomers may have grown accustom to the traditional once or twice a year performance review, but in the fast changing work environment that rarely cuts it anymore. Research from the UNC Kenan-Flagler Business School found 80% of Millennials would prefer feedback in real time rather than get it from traditional performance reviews. While millennials desire for steady feedback is often a source of criticism, the reality is that whether on the giving or receiving end it, a more steady stream of feedback keeps workers more engaged in the daily challenges and opportunities that present themselves on the job. Entrepreneurial spirit: Most millennials instinctively seem to know that thriving in today’s rapidly changing work environment requires continuous learning, acquisition of new skills and calculated risk-taking. The UNC survey also found 92% of surveyed 21 to 24 year-olds said that entrepreneurship education was vital in the new economy – and 30% of respondents had started a business in college.With boomers working longer than their predecessors the millennial bent toward seeking new opportunities or launching a business can serve as both inspirational and instructive to boomers. Ultimately, it is impossible, and frankly, not very helpful, to debate which generation is more effective in the workplace. By collaborating, respecting differences and learning from one another, both boomers and millennials are bound to be better off.